I like pears well enough on their own, but when they are warm like these are, they are even better! For those who don’t like cinnamon (who are you people?!? 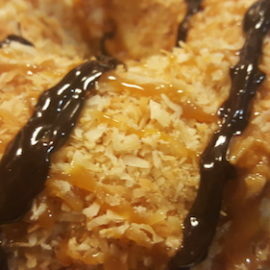 ), you can omit it and just have caramel. Or substitute the cinnamon with something else to flavor. Chili powder, if you like spicy, cardamon, star anise, or just add teaspoon or so of salt for salted caramel! I made this the other night for the Man and the Girl. She helped with the pears while I did everything else. 🙂 You can use any type of pear you like, I just happened to use Bosc pears. Peel and core pears, leaving stems in tact. Or, peel and cut in half, then core. Your choice. Add pears to the boiling syrup. Reduce heat, cover, and let simmer for 10 minutes. Use this time to make caramel sauce! Put sugar in sauce pan. Use a spatula or wooden spoon, stir sugar over medium high heat until a golden color. Put butter into sugar and keep stirring! When butter has completely melted, take off heat and add cream a little bit at a time, still stirring. Toss in cinnamon, incorporating it complelety. Set sauce aside to cool a bit. Turn pears and let simmer for another 10 minutes, until they are tender. Remove pears and pour caramel sauce over and serve! The caramel sauce will thicken as it cools. It shouldn't cool too much in 10 minutes, but enough to be able to pour over the pears. If it has thickened too much, warm it up a bit.